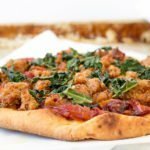 Pair this Italian Sausage Kale Flatbread with your favorite wine for an easy, delectable summertime dinner. 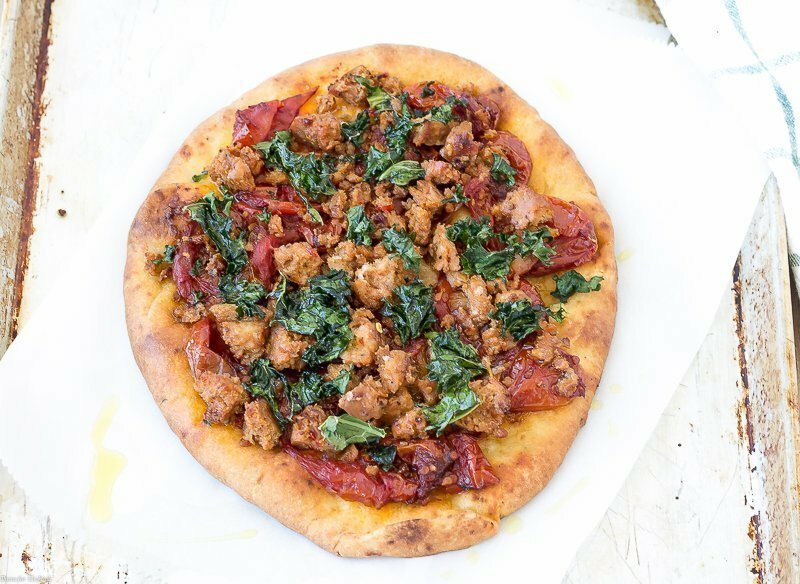 Lightly grilled flatbread topped with roasted tomatoes, hot Italian sausage, fresh kale and a drizzle of roasted garlic olive oil. Some days just don’t work out the way you plan them to. Paul will tell you it’s because I plan too many things. Not all at once necessarily, but just planning in general. [bctt tweet=”Italian Sausage Kale Flatbread #wineWednesday #snacks #munchies” username=”thyme4cocktails”] In my defense there have been contributing factors over the years to reinforce my logistical nature. Such as working in aviation in the Army. Didn’t know that about me did ya?! For about 5 years I worked on various airfields; scheduling 400+ aircraft daily, maintaining flight records, filing flight plans with the FAA… planning was all we did. 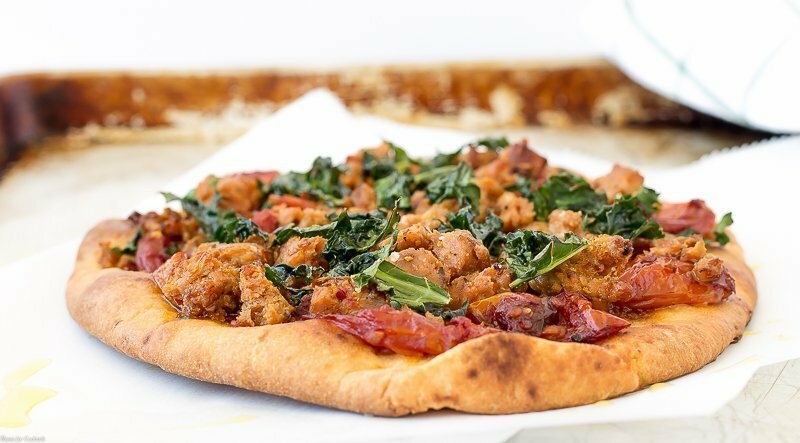 So what do flight plans have to do with this Italian Sausage Kale Flatbread? 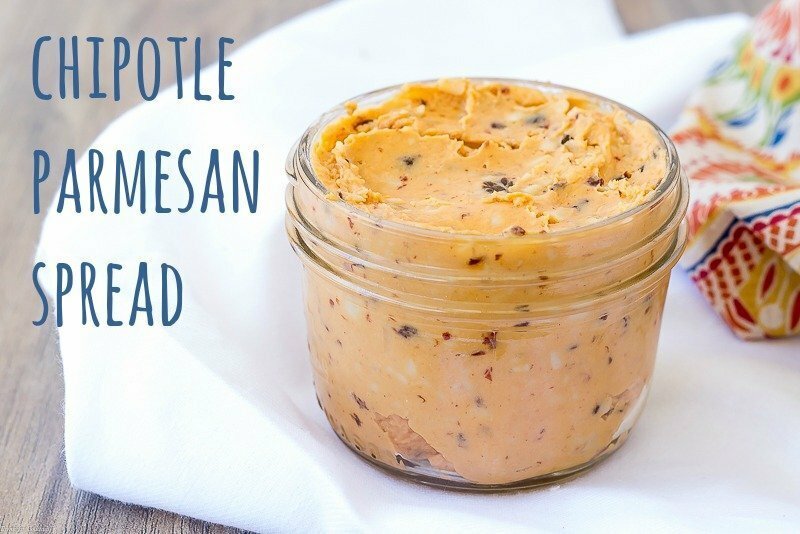 Basically nothing… except that I planned on making a flatbread with the Chipotle Parmesan Spread I dreamt up last night. But then I couldn’t decide on my toppings. So I scratched the whole deal in favor of this variation. And dreamt up a slew of recipes to make with the new spread. Plan tossed out the window. Place flatbread on a large baking sheet, brush lightly with oil. 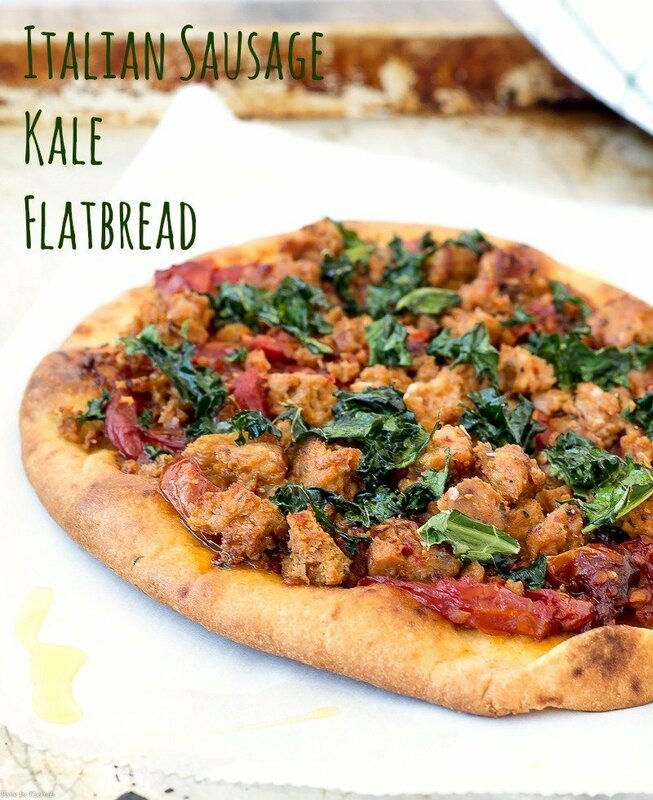 Top flatbread with desired amount of roasted tomatoes, sausage and kale, drizzle with more oil. Bake 7-11 minutes until slightly crispy.